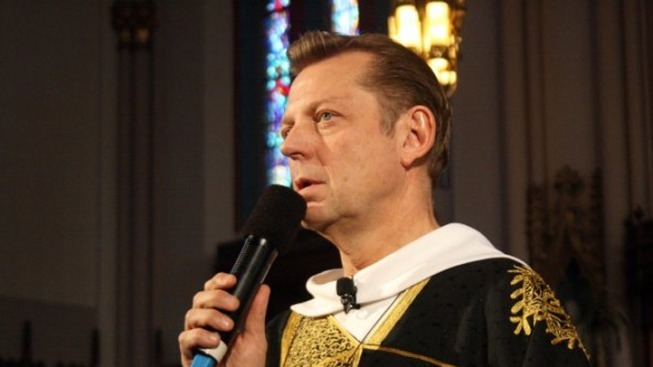 Father Michael Pfleger, the outspoken pastor at St. Sabina’s church in the Auburn Gresham neighborhood, called on the state of Illinois to declare a state of emergency amid dire economic situations in Chicago and Illinois. The comment was made during an appearance at the City Club of Chicago Monday. Pfleger participated in a panel on “Chicago’s Homicide Crisis” alongside Chicago Police Superintendent Eddie Johnson and the Democratic nominee for Cook County State’s Attorney Kim Foxx. Pfleger encouraged using federal resources to embolden communities and bolster the police force. Pfleger stressed the need to address the root causes of the city’s gun violence epidemic, like underserved communities, education, unemployment and gun control, among other things. He also addressed the need to mend the relationship between communities and police and improve community accountability. “If everybody just takes care of their block, block by block we can take back this city,” Pfleger said. Additionally, the pastor faulted the National Rifle Association for allegedly contributing to the increase in guns on the streets, claiming that politicians "have been bought by the NRA and aren't willing to do anything to make it so guns aren't as accessible on the streets of Chicago." He also took time to address national politics and the rise of presumptive Republican presidential nominee Donald Trump. "Look at this election," Pfleger said. "I'm ashamed to be an American right now. I'm ashamed to be an American to think that somebody with views like Trump has risen to the office of possibly becoming the president of the United States." Pfleger said that Americans need to address difficult realities like race and segregation. "It's real in America," Pfleger said. "And guess what, the Trump America we're living in now is dangerous. We now have racism, it's got a second breath from this man." "Racism and segregation are on the rise in America and we have to deal with it," he added. During the panel, Johnson discussed a new commitment to accountability within the Chicago Police Department. Johnson said CPD was using town hall-style meetings to interact with community members and build relationships. He also outlined the department’s strategic subject list. “We have what we call a strategic subject list,” Johnson said. "That list documents people, its a computer software program that documents who will most likely either be victims of gun violence or the perpetrators of gun violence." The superintendent noted that the list will typically consist of 1,300-1,400 people and promised that the program doesn’t identify people based on race, gender, ethnicity or geographic location. Johnson said that of the 66 shot over Memorial Day, 80 percent were on the list. Additionally, 100 percent of that weekend’s offenders were on the list. During his speech, Johnson also called for the strengthening of mandatory minimum sentences for crimes involving guns and pointed out some stark statistics. Johnson said that since Jan. 1, CPD has removed one illegal gun per hour, every day this year. He also noted that Chicago removes more guns than the LAPD and NYPD combined. “It’s because we have that many more guns out on the streets of chicago,” the superintendent said. Foxx pushed for proactive solutions to the city’s violence. She also said it was vital to look at jobs and neighborhood investment, as well as education. “We have to deal with our educational systems, our public health systems, our mental health systems in partnership with the goal of prevention because enforcement comes after the fact,” Foxx said. Cleopatra Pendleton, mother of Hadiya Pendleton, also participated in the panel. Pendleton was shot and killed in 2013 while standing in a Kenwood park with friends. One week earlier she performed at President Barack Obama’s second inauguration. According to the Chicago Tribune, the city recorded its 300th homicide after 59 were shot this weekend, 13 fatally. Chicago police announced late Monday that nearly 100 guns were confiscated off the streets of Chicago over the weekend, including a handful of semi-automatic weapons.